The SmartDV's LVDS verifies the Radio Front end-Baseband digital parallel interface.LVDS VIP can be used to verify BBIC or RFIC and SPI Master or Slave following the LVDS basic protocol as defined in LVDS and provides the following features. Supports BBIC and RFIC Mode. Supports SPI Master and Slave BFM. Supports half duplex data transfer. Supports both data path transaction and SPI control interface transactions. Supports TXD, RXD09 and RXD24. Supports 2bit I SYNC and Q SYNC data. Callbacks in BBIC and RFIC for various events. 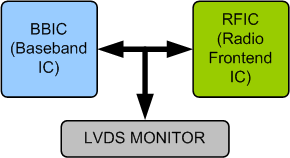 Functional coverage to cover each and every feature of the LVDS specification. Test suite to test each and every feature of LVDS specification. Faster test bench development and more complete verification of LVDS designs. Easy to use command interface simplifies testbench control and configuration of BBIC and RFIC. Comes with complete test suite to test each and every feature of LVDS. SmartDV's LVDS Verification env contains following. Complete regression suite containing all the LVDS testcases. Examples showing how to connect various components,and usage of BBIC,RFIC and Monitor.